Wordless Wednesday – Anyone for Badminton? 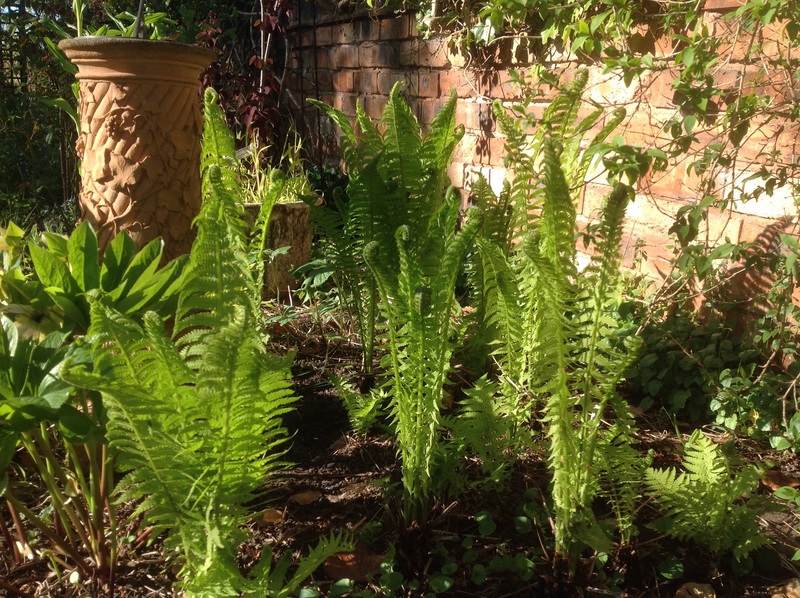 This entry was posted in Uncategorized and tagged Shuttlecock fern, Wordless Wednesday on April 29, 2015 by thelonggardenpath. 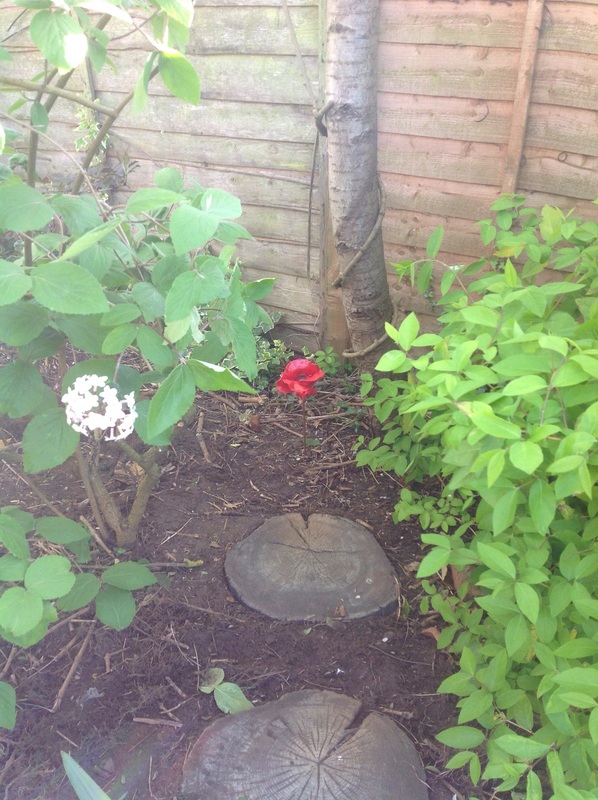 Without too much fanfare, the time came for the Remembrance Poppy to be planted. Still in its box since Christmas, much thought had gone into where, in the garden, we should place it. And, uncertain as to how frost-proof it was, we wanted to wait for warmer weather. Initially, I considered in the herb beds, to be visible from the French doors. Hmm! But then, after an overhaul of part of the Scented Shrub border, a focal point presented itself. 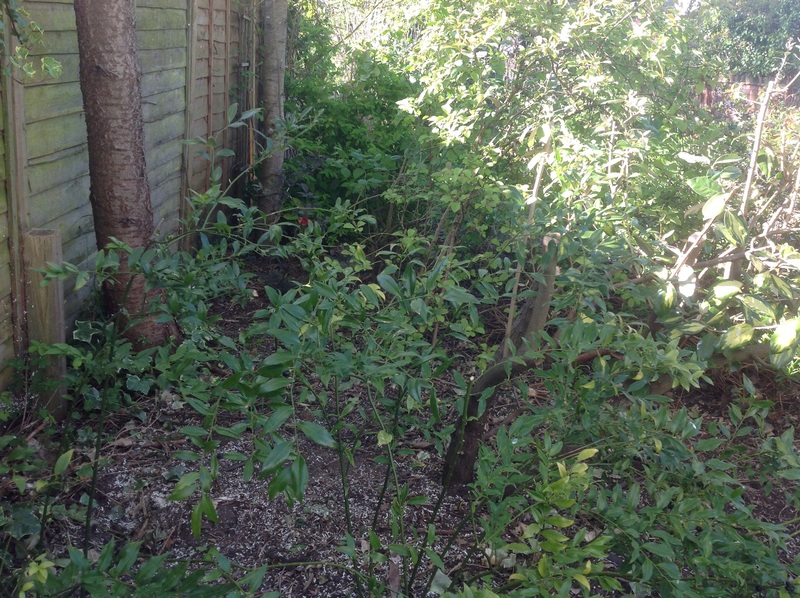 The drastic measures began last year, when the Lonicera fragrantissima, was severely cut back. One or two of the lower branches had layered themselves and created new plants, growing away happily. Unhappily, I had to remove these, leaving only the best placed shrub. I started an experiment. There was a large gap at the back of the border, which I wanted to fill. 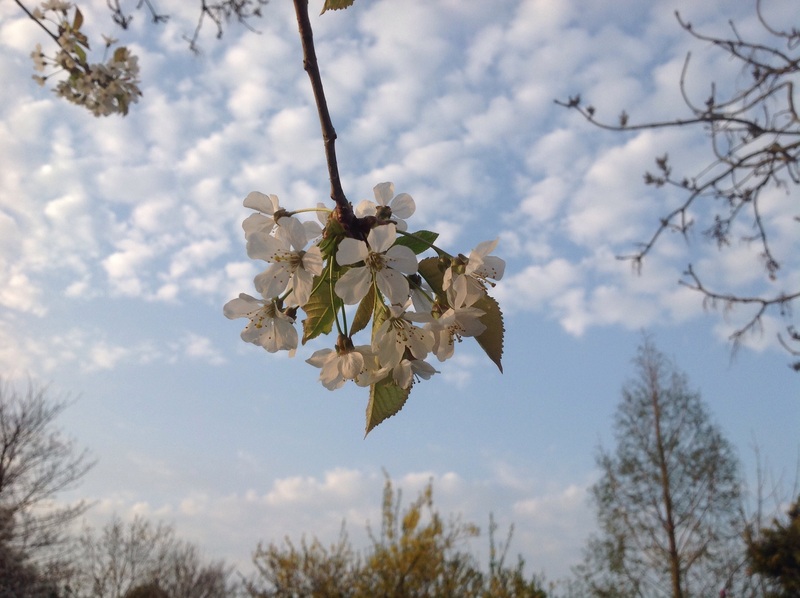 It may go against best horticultural practice, to plant a shrub in a densely shaded area beneath two cherry trees, when the shrubs all around were already growing towards the light, but I thought I’d take a chance. I chose a dark-leaved elder, Sambucus nigra “Gerda”, my thinking being that elders are often found on the edges of woodland. Apart from its dark leaves, it also has pink umbels of scented flowers. But that would necessitate a path or gap in the planting to be able to appreciate its perfume. We put down two stepping stones to cross the border, but we then had the dilemma of a focus at the end – a path must lead to something! Eh, viola! The Poppy would be perfect! It’s in our direct line of vision, from one of our garden seats. The overhaul has now moved on. Two hollies, originally planted at the outset of the border, used to form a bit of a hedge, separating the Scented Shrub border from the Courtyard, with its herb beds. Unfortunately, they hadn’t responded too well to some severe pruning. So we took the plunge and cut them down. This leaves more available planting space. I still wanted the effect of a hedge, so I’ve chosen to replace the holly with a scented alternative. Portuguese Laurel, Prunus lusitanica, is a hedging shrub, with scented flowers, that should grow quite quickly and suit the shady conditions. And there’s possibly yet more planting space available! 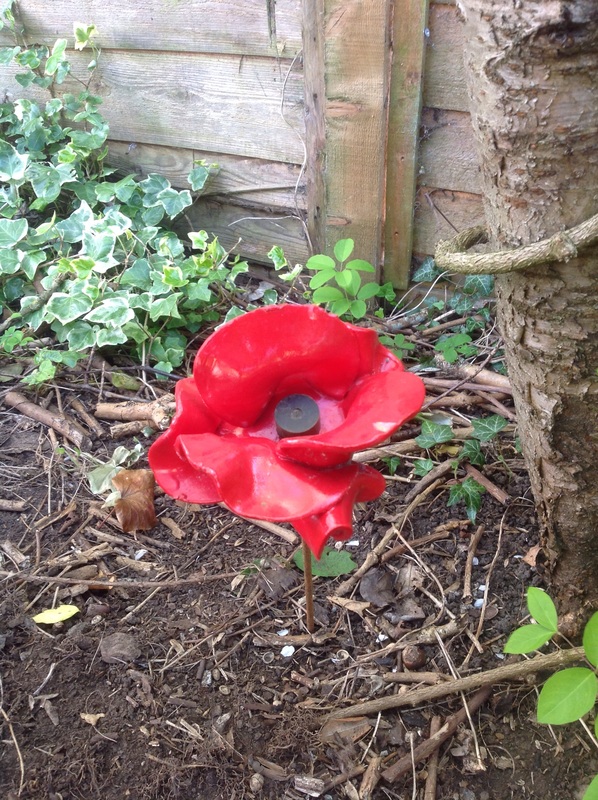 But back to the Poppy! I think it looks quite smart at the end of the path! It’s just a shame that we were a day late for Anzac Day and their remembrance ceremonies! It would have been quite appropriate. Still, they did choose Rosemary as their flower of Remembrance! This entry was posted in Uncategorized and tagged Prunus lusitanica, Remembrance poppy, Sambucus nigra on April 27, 2015 by thelonggardenpath. What a difference a month makes! Gone (or almost gone) are the winter flowering shrubs of last month. However, our Coronilla “Citrina” is determined to prove me wrong, by defying the seasons and to continue flowering. It has been, since last autumn. But, however valuable the long flowering shrubs are, it is nice to move on. 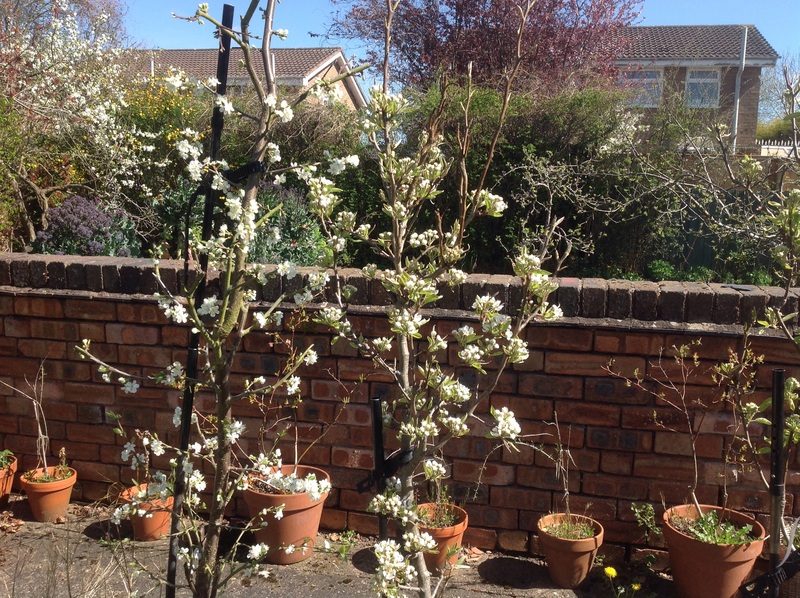 We inherited several shrubs when we first moved in, including two cherries of unknown variety. They were to provide a backdrop to our scented shrub border and so it’s nice to realise that, when in bloom, they have a very delicate scent. And, as you can see above, they can be stunning against a blue sky! Elsewhere in the garden, there is so much scent to share with you. But where do I start? Ok the scented shrub border itself. I love watching these Viburnum flowers develop! 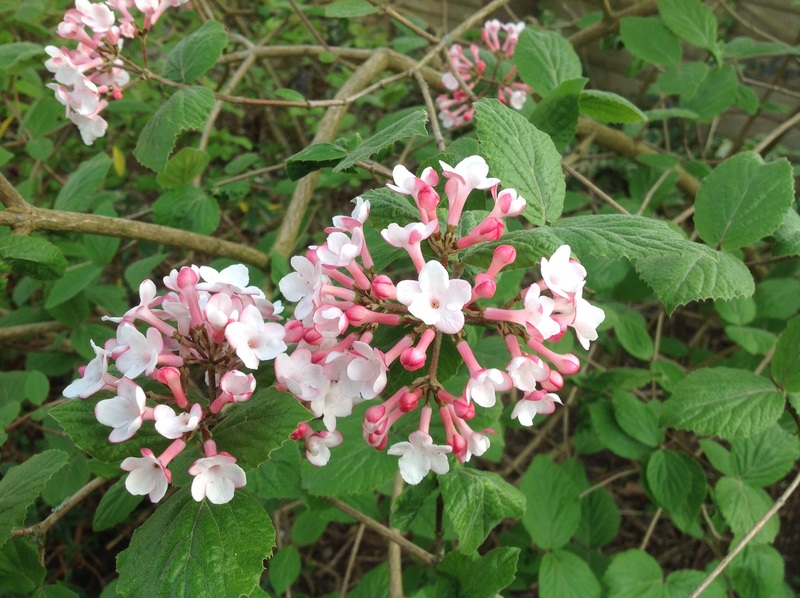 This is Viburnum carlesii “Aurora”. The buds start off looking like clusters of tiny rubies, before they open into domes of pinkish white flowers, that have the clove perfume similar to pinks. They have the added bonus of autumn coloured leaves, too. 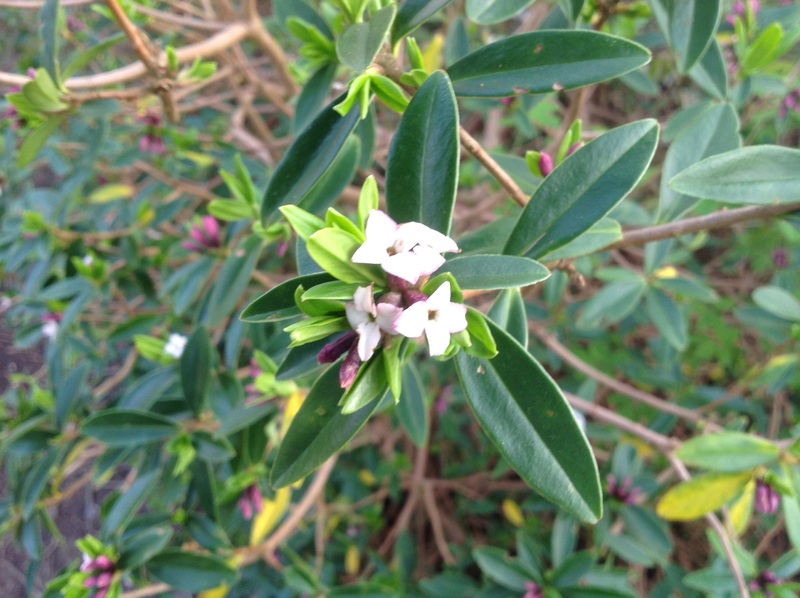 Our Daphne tangutica has just started flowering. 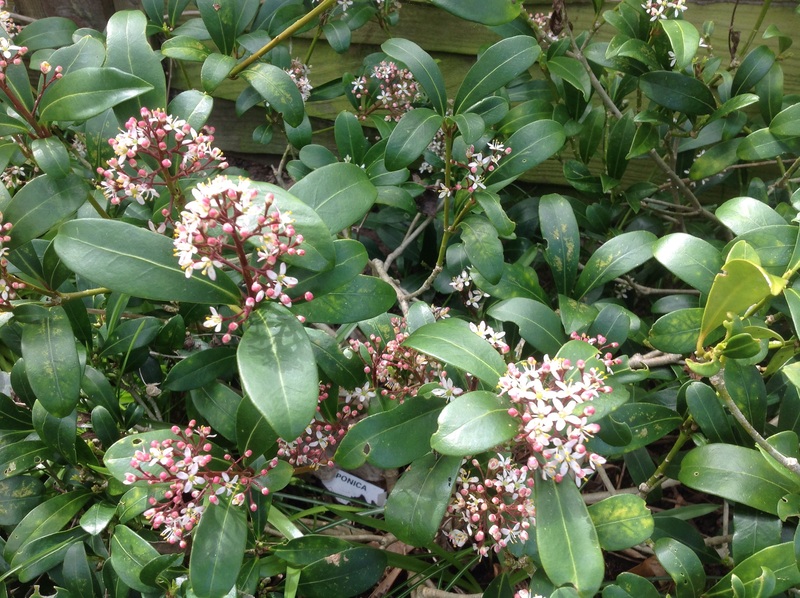 This evergreen shrub starts flowering now, with tiny white flowers, opening from purple buds. It has a strong perfume, with a heady scent so similar to Jasmine. And it does repeat flower, over the summer. For me it flowers again in June. And so more pleasure! 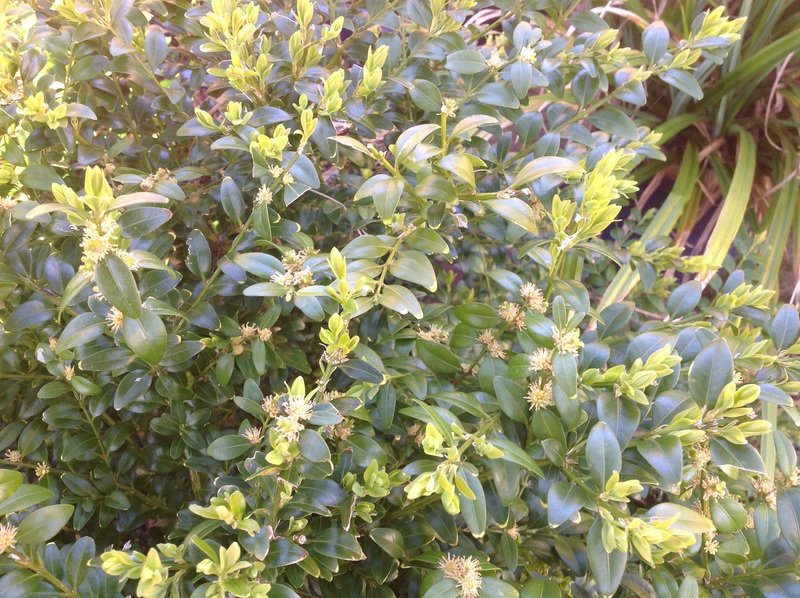 Osmanthus delavayii is a wonderful shrub! It has small, dark green, evergreen leaves, that are well suited to hard clipping, making it a good subject for hedging. 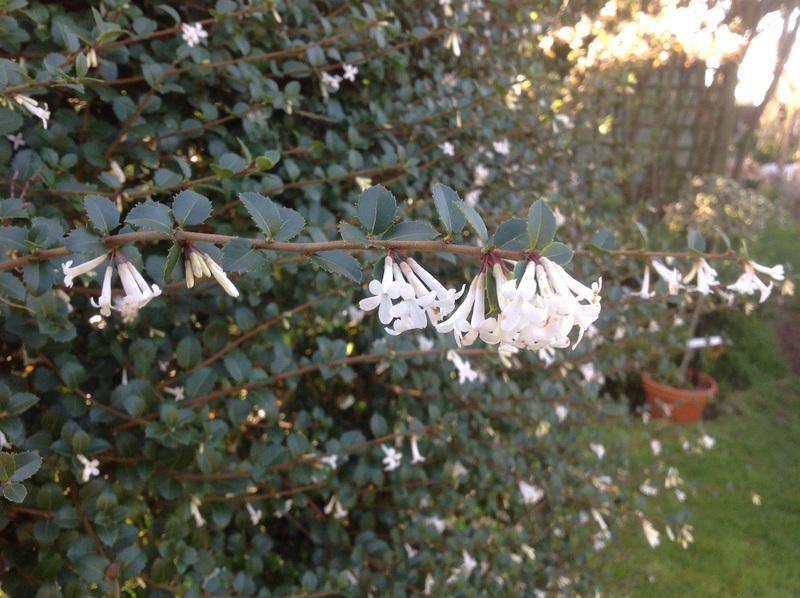 It has tiny white flowers, that smother the plant and has such a strong perfume that will follow you round the garden – well, a bit of the way, anyway! Skimmia japonica “Rubella” is regarded as a stalwart of the Winter garden, by virtue of its ruby red buds. But it’s now, in April, that these buds open to produce cones of sweetly scented flowers. This variety is male – you need to have both male and female to produce its lovely red winter berries. Here we grow the female “Red Princess” to this end, although its flowers are not so impressive. The scent doesn’t end here. I recently planted Clematis armandii “Apple Blossom” to cover the pergola over the dining area. It was in bud then, but now it’s flowered for the first time and what a perfume! Strong, sweet and almondy. It has long, evergreen, leathery leaves which should grow to partially cover the area. In the Woodland Garden, our unknown Pieris is looking amazing now, with its large clusters of little white Chinese lanterns. 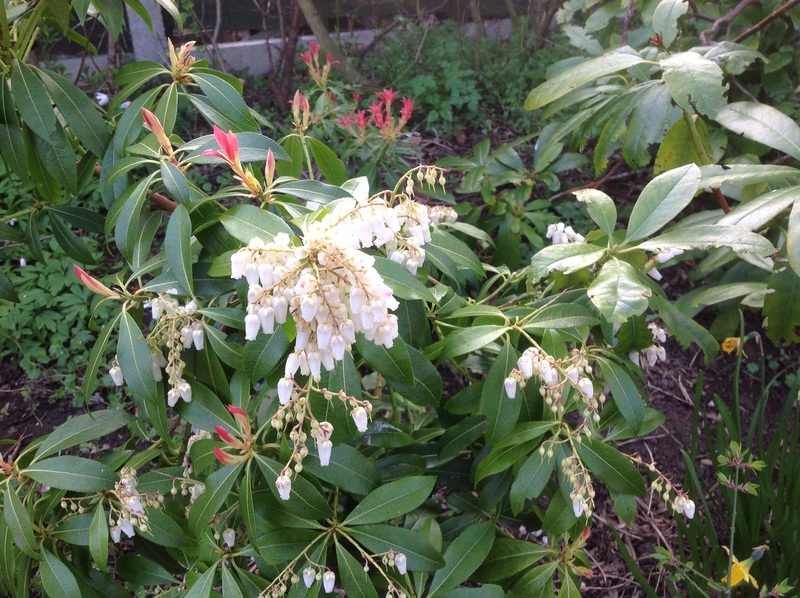 I had heard rumours of Pieris being scented but hadn’t noticed any perfume. 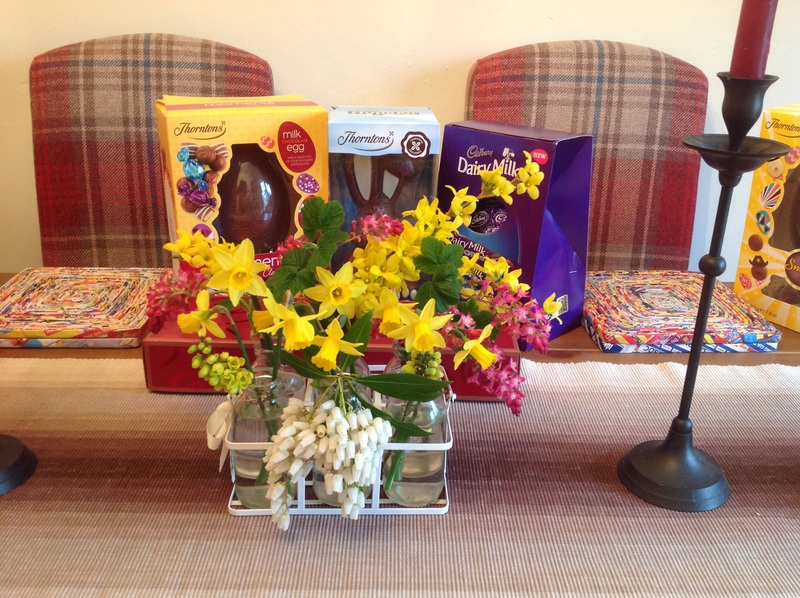 At least, that was until I decided to cut a sprig for an Easter arrangement, and then I noticed its delicate perfume. Even the Allotment is playing its part. 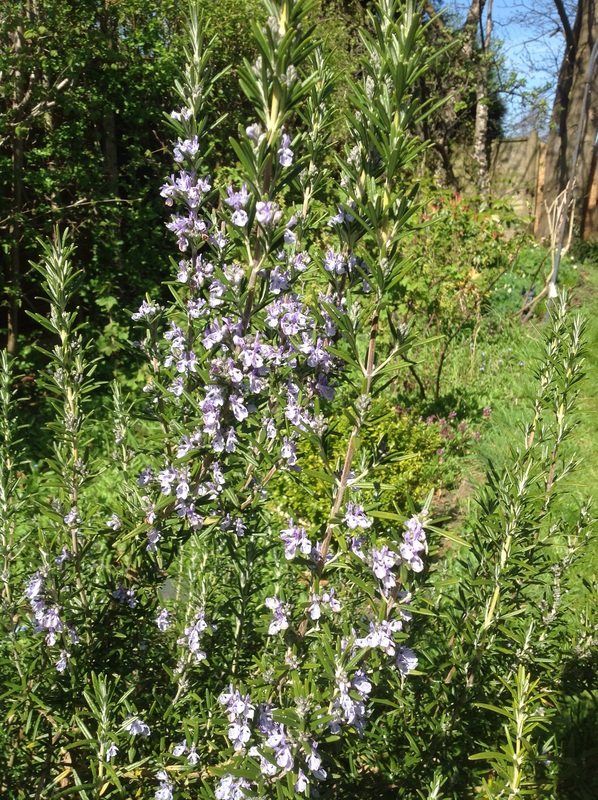 Admittedly, the edging of herbs will be scented continually, but I felt that the aromatic Rosemary bush, decked out in its blue flowers, was worthy of showing here. 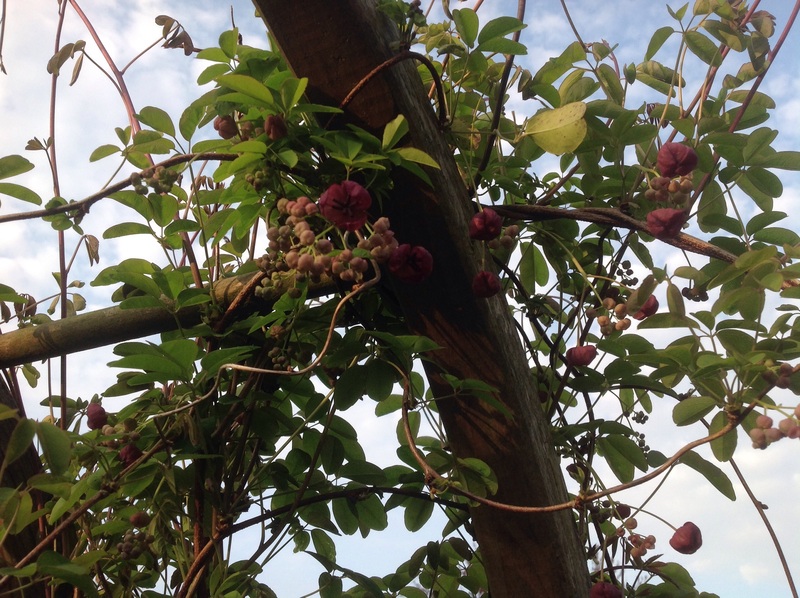 And at the entrance to the Allotment, we have a beautiful Akebia quinata scrambling over one side of an arch. Love it or hate it, the smell of Box is another one available all year round. Here, it also has the fresh lime green flush of its flowers and new leaves. I must finish with a much overlooked scent in the garden, that of newly cut grass. A fellow blogger (Thank you, Biking Gardener!) commented on my last post about the smell of a freshly cut lawn, and that got me thinking. It’s definitely worth including in the Scent in the Garden meme! Thank you to Louise at Welly Woman and Sue at Backlane Notebook for hosting this meme. 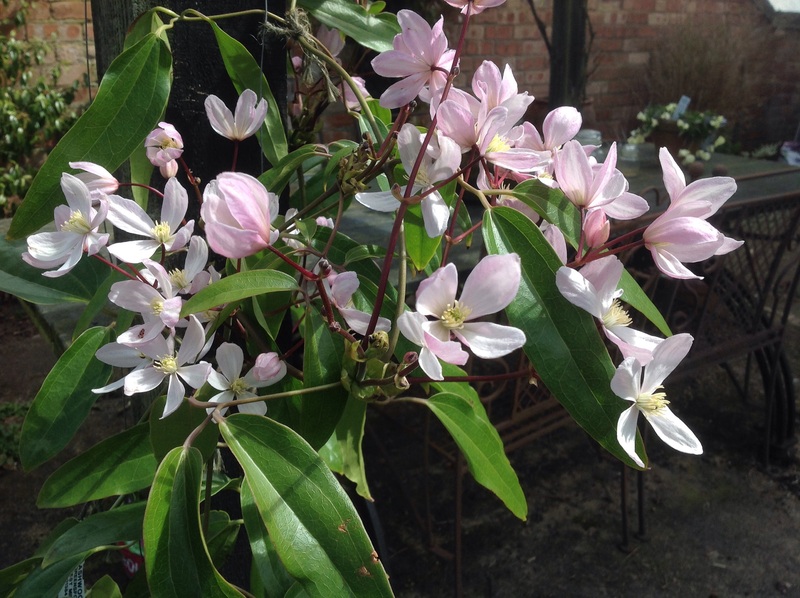 This entry was posted in The Scented Path and tagged Akebia, Box, Cherry tree, Clematis armandii, Daphne, Pieris, Rosemary, Scented shrubs, Skimmia, Viburnum on April 20, 2015 by thelonggardenpath. A beautiful day off, spent in the garden, has thrown up some lovely things to share with you. on show. After all, isn’t that what the garden is about? Well, it didn’t take too long to start idling! 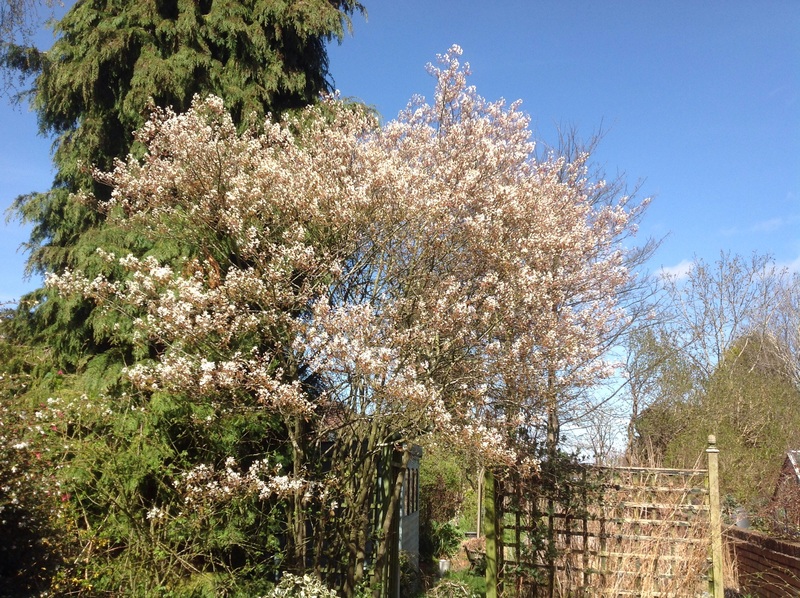 The site of the Amelanchier in full bloom against the clear blue sky, was able to stall me before I even started! 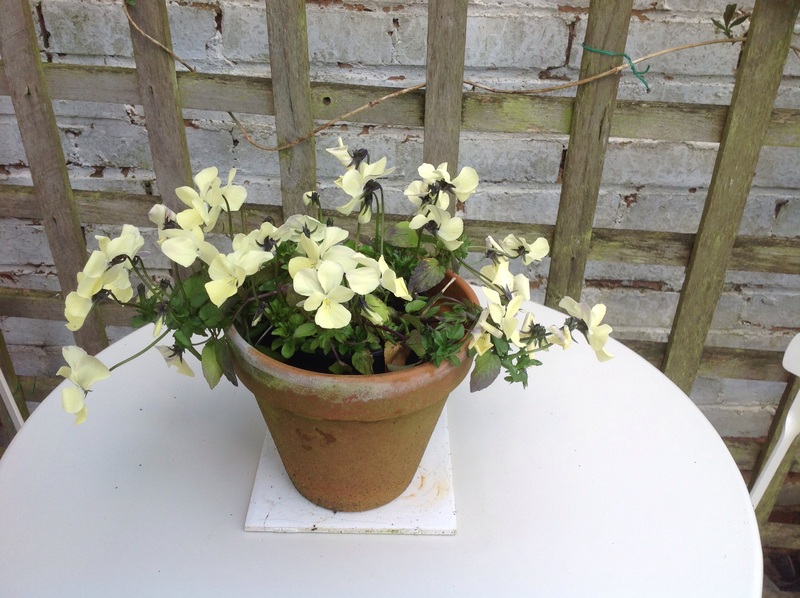 Then there was the lovely lemon violas, bought last autumn for late summer flowers. They’ve come back so beautifully now, decorating our patio table. 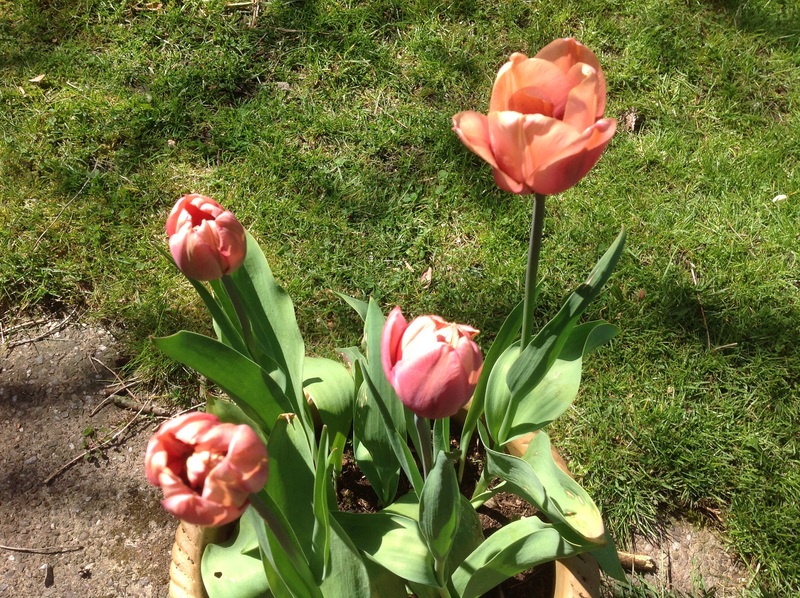 Then there’s my tulips, just starting to open. “La Belle Époque”, after its wonderful display last year, was intended to be lifted after flowering and then replanted. But, as in the words of the Scottish Bard, “The best laid schemes…..” etc. So come spring, I’m afraid to say, they were still in last year’s pot. I didn’t hold out much hope. But, they have come back, and are now flowering, albeit not to last year’s splendid display. I may not keep them for another year, as they’re showing signs of disease, but it’s a lovely floral bonus! 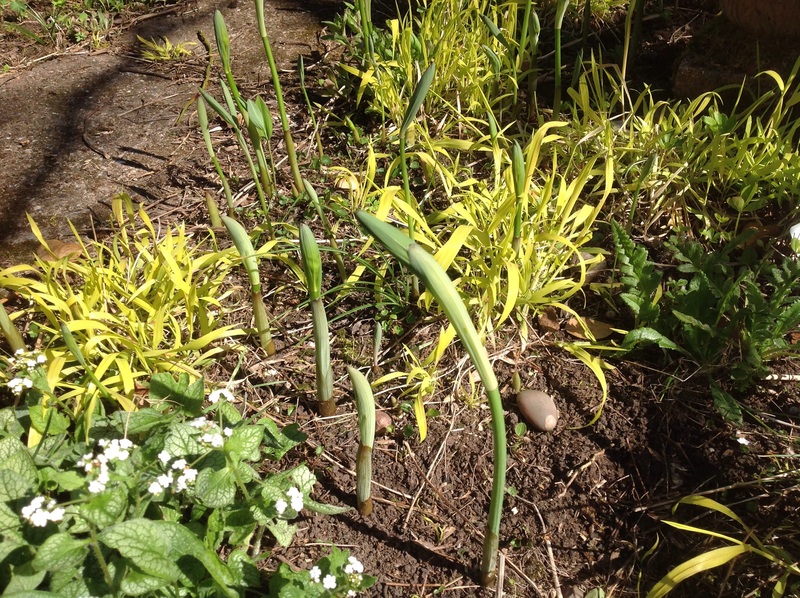 I always enjoy watching the “Snake Dance” of the emerging Solomon’s Seal. The sight of the fruit cordons, flowering again, is so reassuring! And sometimes the simplest pleasures are the best! The first cut of the season. 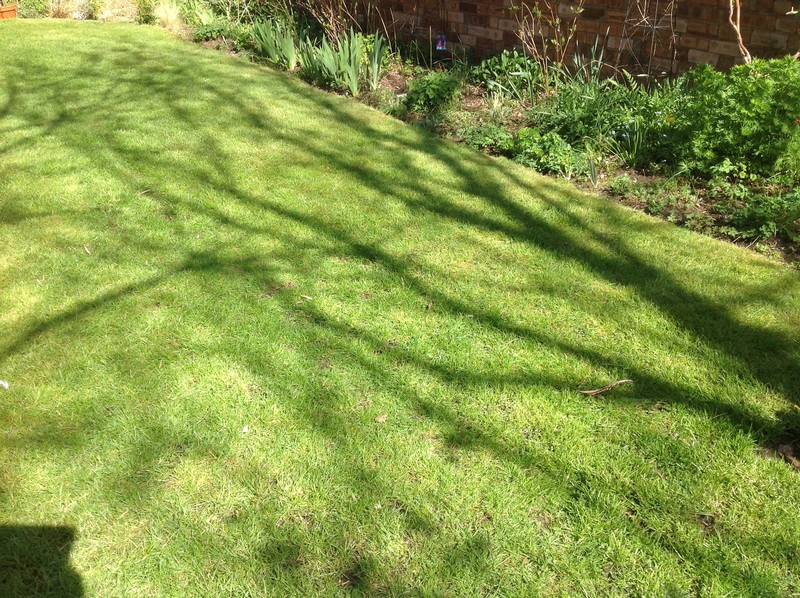 “The garden always looks better with the grass cut!” At least, that’s what we always say! The bees and butterflies were happy to keep me company. And the birds provided the sound track. Now, all that’s needed is smell-o-vision for the complete experience! This entry was posted in Uncategorized and tagged amelanchier, fruit cordons, solomon's seal, tulip, viola on April 14, 2015 by thelonggardenpath. Wordless Wednesday – The Only Way Is Up! 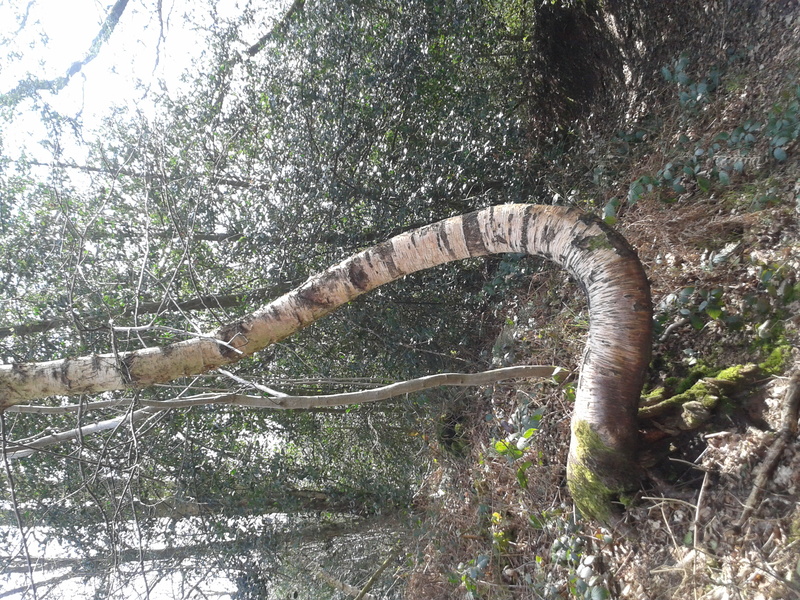 This entry was posted in Uncategorized and tagged Habberley Valley, Silver birch, Wordless Wednesday on April 8, 2015 by thelonggardenpath.